It's not everyday that you get to have your summer holidays 20% cheaper!!! Banks are trustworthy when it comes to fees! No, I'm kidding! I checked at my new BCV bank and noticed that their rates (1 euro = CHF 1.0260) seemed correct in regard to what the FOREX was claiming for (i.e. something around CHF 0.99 or so). The first interesting point to note here is: BCV offers better exchange rate if you withdraw money directly at their ATMs instead of going through their over-the-counter. I didn't check how much percentage they take more, but it must be true as they advertise it themselves on their mobile app. Next, I went to the CFF office which is known to provide foreign currency exchange services. Below CHF 2'000, they were at something like 1 euro = CHF 1.04. And above CHF 2'000, the rate was lowered to 1.0375 or so. "What? Really? Banks are the cheapest this time???" was I wondering. I moved to Crédit Suisse and UBS and their price were equal to their supposedly premium quality: 1 euro = CHF 1.05. It's only a few cents difference, but for the CHF 5'000 I wanted to exchange, by just choosing one door instead of the other, I was getting approximately 100 euros more - one more hotel night in Canada for free!!! I learnt later on from colleagues that Swiss Cantonal Banks are usually the cheapest regarding currency exchange rates - between all banks. 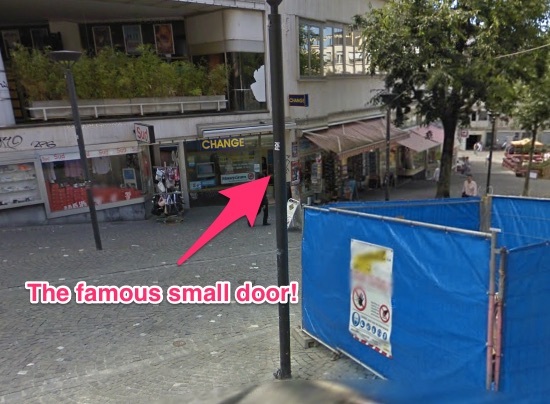 By chance, I often pass a small currency exchange office close to the Lausanne main station and I wondered what they would offer in such a tiny-not-so-nice-looking exchange point. I entered the next morning and asked their rate. "How much do you want to exchange?" he asked. "1 euro = CHF 1.005" told me the cash-exchange guy. "Sorry? Are you sure? Can you repeat" did I asked. So, to make it short, by entering the correct door and not let yourself be attracted by shiny Swiss bank buildings, you can save a lot of money. In my case, I feel like two hotel nights of our next Vancouver trip are paid off. Just because I choose the small ugly office instead of the magnificent one. Since I discovered Mustachianism, this advice proved to be true in so many cases: from our M-budget Internet package that doesn't look as nice as what Swisscom would propose for instance, to our new awesome car that doesn't have a Ferrari exhaust sound, neither the looking! And actually, I really think there is more beauty in what these things - because they are only things/stuff - are able to give you in regards to what you invest in them. I'll stop here with philosophical thoughts, although I would be very interesting to know what experiences do you have in the world of "awesome return on investment even if not so nice looking"? Also, more related to the topic, what is the best place to exchange currency in your own canton / country?